What a fantastic idea Karl! After dealing with lots of snow, we headed for sunnier and warmer days in NOLA to watch the Super Bowl with Karl and Tonya. Well, the weather wasn't that much warmer, but it was sunny for the days that mattered. 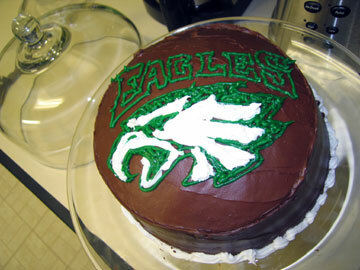 Our trip began on Wednesday, February 2nd and ended on Monday, February 7th. Wednesday ended up being a very long day, starting a half day of work early and then finishing up last minute packing before heading to the airport. Karl and Brian had an amusing conversation regarding hair dryers due to my need of bringing my own even though Tonya would most likely have one. we got to their place Wed night (just missing the Krewe of Muses, a parade given by only women), greeted by their absolutely adorable "child" Barley and spent the night catching up and being amused with their DirectTV TiVo capabilities. But that wasn't enough for Brian, trying on several occasions throughout our stay to get Karl to purchase an HDTV before the SB ("where's the nearest Best Buy or Circuit City?"). Karl stood firmly with his decision to eventually buy one for next season. Thursday's activities were filled with a tour of Karl & Tonya's neighborhood, stopping by some of Tonya's favorite shops, antique stores, and one of their local bars. We also visited a cemetary, and the weather added to the ambience by being overcast and cool. I'm glad to say that the Garden District is nothing like the French Quarter, which Brian and I have visited three times already without leaving the area...granted two of those time were during Mardi Gras...which of course was happening this same weekend and ending on the Tuesday after we depart. For dinner, we got our hands dirty cleaning both lots of shrimp and crawfish with some spicy potatoes and corn added to the mix. Brian and I were also treated to our own crab, which I ended up taking forever to eat. Nothing like messy seafood and white wine to start the night off...actually some red as well. Tonya had to work pretty early the next day, so she couldn't join us for the parade festivities that night. Karl packed a bunch of beers for us to enjoy while the parade passed by. Luckily he only lives a few blocks from St. Charles Street which is part of the parade route. More families out in the streets where we were as opposed to the crazy drunkeness of college students who most likely lined Canal Street near the French Quarter. 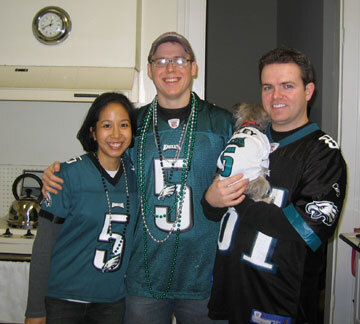 Wearing Philadelphia Eagles beads and hats caught some attention, in a good way. No signs of Patriots fans around. Since we just caught the end of the first parade and the second was surprisingly short, we headed to a couple bars: a small dive near their place watching some basketball and talking about none other than sports and the fate of the NHL, and the second one being where we ate some chicken fingers, drank beers and rum and coke and talked about some of our most embarrassing moments in a tiny corner on the upper floor. Hilariously good times. So, okay. 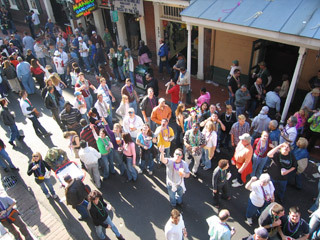 One full day outside the French Quarter. Friday, we took a trolley to eat at one of K&T's recommended gumbo restaurants appropriately called the Gumbo Shop, located in none other than the FQ. Yes, we couldn't resist walking down Bourbon, passing one of our favorite old haunts - Krystal's, but eventually veering to off the beaten path. Crowded little place this restaurant was, but the food was scrumptous and the margaritas were smooth and perfect. We went to an outdoor market and strolled along near the waterfront before heading back to catch the parades that night. Of course, the city closed down certain streets ahead of time to clear the streets, and unfortunately we waited and waited before realizing the route we wanted had already been cut off. Luckily though, our escape route was just a couple blocks away as we waited with other locals, hoping the bus would come by soon. I forgot to mention that the uptown parades are great since you get to go up real close to the floats and that in certain parts, there aren't many people. 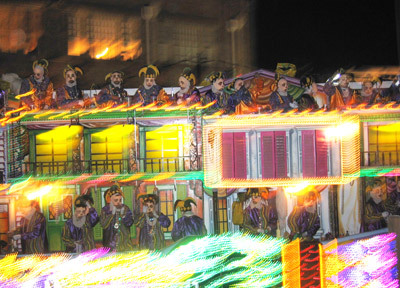 That night, we caught two parades, with the second being Le Krewe d'Etat, which had some of the best floats, of which we saw were mainly political figures and celebrities. 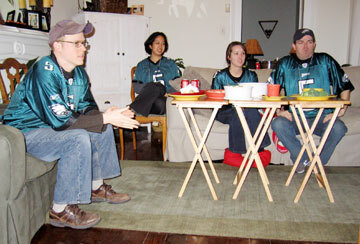 We didn't get to watch the end of that one since Tonya, Brian and I had to use a bathroom desperately. Lindsay, one of Tonya's bridesmaids lived near the route, and we ended up going to her place. 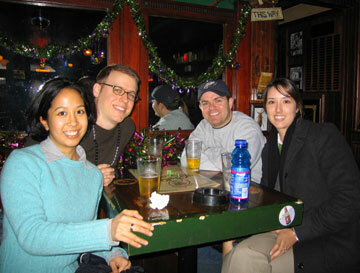 We had such a great time the next day. 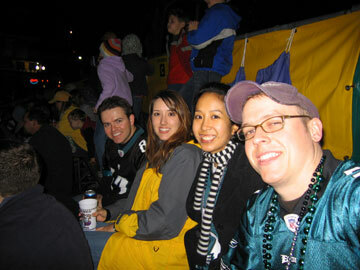 After getting dressed in Eagles jerseys (#5 for Donovan McNabb and #81 for Terrell Owens) and a jump start with a tequila shot that I would later regret (K&T opted out), we took a bus down to the FQ for some bead-throwing action. We had access to the Royal Sonesta Hotel balcony through K&T's company, and luckily the weather was beautiful and sunny. There was an open bar and some snacks to munch on, but we spent most of the time out on the balcony. It's such a different dynamic being the ones throwing the beads. Everyone below is just begging for some, and you can choose to give them some or not. You can just pick people out of the crowd to throw to, even just to get people to stop flashing you, because believe you me, there are some people out there that should think twice about doing it. 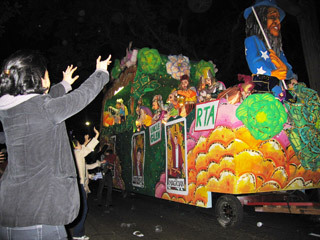 Actually, it's quite funny -people going crazy for some plastic beads. "Dance monkey dance!" kept going through my head, but having been in their place, I know what it's like. It's great to have both perspectives. 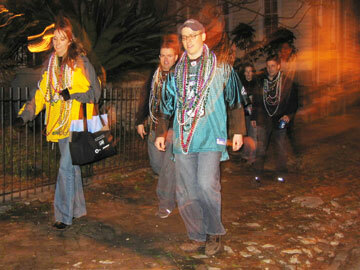 If there was one thing for sure, any Eagles fan that passed by would get some beads, no doubt. We brought a bag of beads we collected the nights before and some that K&T had leftover from previous years, but our supply quickly diminished. 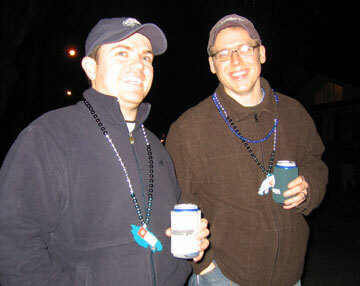 We were careful to keep the "money" beads for last, while giving away the "not-so money" beads. The "money" ones were more unique and usually had larger beads than the others. 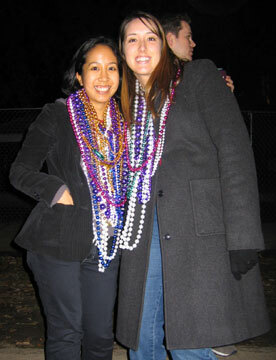 Once we were low on beads, one of the hosts gladly replenished our stash, almost as quickly as we refilled our cups. Not feeling a 100% yet, I joined the crew as a couple of K&T's friends showed up. (I'm so bad with names, I pretty much forgot everyone's that night.) We took a cooler filled with drinks and munchies and walked all the way to our bleacher seats located at Lee Circle. We didn't leave as early as we planned, so when we finally got there, it was pretty crowded. We ended up being on the top few rows. We nibbled on some yummy treats Tonya made as we waited for the parade to begin. We also discovered that there were a couple of scavengers that picked up beads that fell through the cracks, kinda gross with all the garbage that falls and is thrown under the bleachers. let's just say that it was heaping. 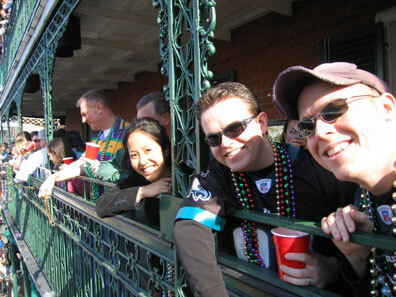 I did manage to grab a couple beads as well as a whole bag that landed on the bleacher near me, but getting frustrated with my catches or lack thereof, I decided to make my way closer to the floats and luckily stood next to some rather expressive girls. I was satisfied with my loot soon after. We were planning to use our goodies for throwing off the balcony the next night. It was a very long walk home for Brian and Karl who both had to relieve themselves. But unlike Karl, who found a solution on the way, Brian stuck it out all the way back. Too bad we walk much faster than those cowpokes and had to wait for them to open the door. A cloud of frustration, anger and disbelief silently fell hard upon us. 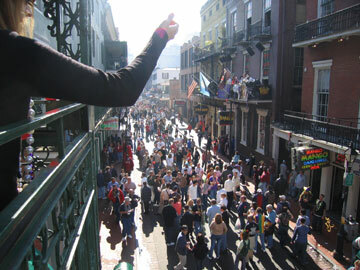 So in our state of sadness, we didn't make it out to Bourbon Street as planned, where Patriot fans would most likely have been out celebrating. The following day, we all woke up late and K&T dropped us off at the airport for the journey back to Boston. On one of the legs, a woman wore an Eagles sweatshirt and was harassed by a Patriot fan, but she stood her ground and brushed him off. Good for her. So the weekend ended on a sour note, but it was a great time nonetheless. At least it didn't begin the way it ended. We'll just have to look forward to next season...hopefully be then Karl, you'll be enjoying HDTV too. Elmer & Hoong-San get engaged!